Waverley first appeared in 1910 at the Olympia Show, but the previous year Vernon Trier had exhibited under his own name, and on the Marlborough stand, a cyclecar powered by a 9hp V-twin JAP engine. The first Waverley car was a more substantial machine than the Trier cyclecar, with a 1460cc 10hp 4-cylinder Chapuis-Dornier engine and 3-speed gearbox. The 2-and 4-seater bodies were made by E.B. Hall whose premises were close the the Light Cars factory in Willesden. It was not until 1913 that Waverely were shown on their own stand, by then they had larger engines of 1843 and 2116cc still by Chapuis-Dornier. These were listed up to 1916, when the supply of engines dried up, and the factory was turned over to munitions work. 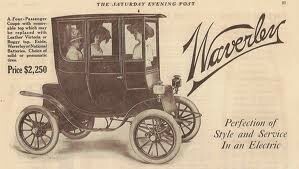 In 1915 the company name was changed to Waverely Cars and in 1919 they moved into a new factory. They used the 2303cc 14.3hp Tylor engine in the early postwar cars which were expensive, running to £750 for a coupe in 1919 and £960 for an all-weather coupe in 1920. In 1922 a smaller and cheaper car was introduced powered by a 1504cc 10.8hp Coventry-simplex engine selling for £325. For 1925 Waverley announced their Light Six powered by a 1991cc ohv Coventry Climax engine, which was made up to the end of production in 1931. A variety of bodies were available on this chassis, saloons, both coachbuilt and Weymann-type, a coupe, a 7-seater limousine-landaulet and a 4-seater sports with vee-windscreen and dual cowl phaeton body. It had a top speed of 70mph. Production figures are not known, but probably very few were made. At the other end of the scale Waverely chose to enter the £100 market with a 4-seater cyclecar powered by a rear mounted 901cc Coventry-Victor flat-twin engine, with friction transmission and spiral gears to the rear axle. It was shown at the Olympia Show in 1926, but only three were made. As late at 1969 Waverley were still listed in the London Post Office Directory as 'motor car manufacturers'. In 1970 they changed their name to Waverley Components & Products Ltd, still at the Trenmar Gardens address, and remained there until 1973.